Exposure to radon gas, as well as cigarette smoking, significantly increases the occurrence of lung cancer. Several hundred years ago, scientists observed the occurrence of lung disease in European miners, and this appeared to be cancer. Further research suggested that radon gas, which is present in rocks, soil, and water, can predispose humans to the development of lung cancer. Whereas cigarette smoking poses the greatest risk for this disease, radon gas also significantly worsens its likelihood . Those who smoke and encounter excessive levels of radon gas have an even higher risk of lung cancer than individuals who have only one of those risks. Of those who do not smoke, radon is the primary cause of lung cancer. The relationship between radon exposure and this malignancy is linear. In other words, the larger the dose of radon is to a human, the greater the predisposition for disease [1, 2]. Human exposure to radon, however, has not changed dramatically over the centuries. What has increased is exposure to radiation from other sources. These include medical procedures such as x-rays, nuclear scans, computerized axial tomographic (CT) scans, diagnostic or therapeutic interventional studies in hospitals, nuclear power, and other occupational situations . This does not mean that medical procedures which involve radiation are unnecessary or inappropriate. In fact, the benefit of their use commonly outweighs the risk from radiation exposure . Radon is a colorless, odorless, and tasteless gas which occurs naturally across the globe. It is a product of uranium decay. The gas travels through cracks in floors of homes, and it easily circulates in the air. The decay products of uranium release radioactive alpha particles which attach to dust and aerosols [1, 2]. When humans inhale radon gas, these decay products deposit on cells in the respiratory tract. This may lead to damage of cellular deoxyribonucleic acid (DNA) and subsequent development of lung cancer. Nevertheless, some people will not get cancer from that interaction . The levels of radon outdoors tend to be low, and areas such as mines, caves, and water treatment facilities generally maintain high concentrations of the gas . It is therefore necessary that all homes undergo tests for radon levels. When the levels are high, certain measures must take place to reduce its concentration in the home. Even if the gas has not reached dangerous amounts, it is essential that repeat tests occur to ensure that residents are not at serious risk for lung cancer from radon [1, 2]. Lung cancer is a well-known public health problem, and exposure to radon gas as well as smoking will significantly increase risk of its development. Preventive measures, however, are effective in reduction of its occurrence. University at Albany. School of Public Health. (2013). Prescription for radon. Retrieved December 13, 2013. World Health Organization. (2009). Radon and cancer. Fact sheet. Retrieved December 13, 2013. 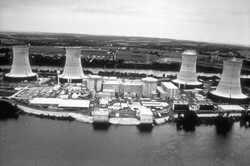 The photograph shows the Three Mile Island nuclear power plant in Pennsylvania and is reprinted with permission from Centers for Disease Control.